As mentioned earlier, hesitation with waxing can come down to a fear of the dreaded “pain factor.” We have all heard horror waxing stories and yes, some can put you off a little. There is always going to be a little bit more discomfort involved with ripping hairs out from the root rather than cutting them at the surface but on the scale of 1 – 10 waxing falls well below the five mark. Also, let’s not forgot those times our ‘trusty’ razors left us with nicks up and down our legs, gosh they sting and man oh man can those little cuts bleed! Did that ever put you off using your razor again, or did you give it a second chance? Yes waxing for the first time can seem daunting but as long as you follow the instructions, use a good quality wax made with high quality ingredients and take your time there is nothing to worry about! A general misconception when it comes to hair removal is that waxing takes too long and shaving is much quicker. If you were to base this on just one hair removal session then yes, shaving is much faster. However, in the long run waxing takes far less time. Generally waxing will give you hair free results that last up to 4- 6 weeks, where as shaving and hair removal creams generally give you results that last for on average 2 days. Let’s so some quick maths now; going off an average of 4 week results from waxing, that has you waxing 13 times a year. If you’re having to shave every 3rd day, that has you shaving 121 times a year. Not only does that use up alot more of your time, but it will also wind up costing much more! Razors and hair removal creams can be cheaper than waxing products, however you will need to use them much more frequently, so does it really end up being any cheaper? Some believe that waxing causes more ingrown hairs than shaving. The reality is any kind of hair removal can prompt ingrown hairs; shaving, waxing, hair removal creams, electrolysis, IPL and laser. An ingrown hair is a hair that does not emerge from the follicle but remains embedded in the skin, usually causing inflammation. They are painful, uncomfortable and unfortunately ingrown hairs can affect anyone (even if you ask them really nicely not to bother you)! Whether you are shaving or waxing, dead skin cells can accumulate and form a papule as the skin heals. 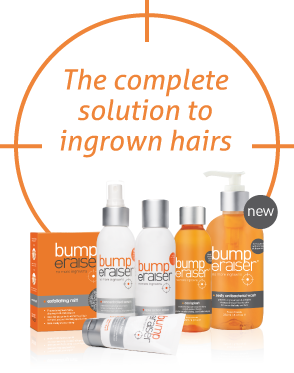 Hair growing in the area may get trapped under the papule and is prevented from exiting the skin, creating an ingrown hair. The most effective way to prevent this is to exfoliate and moisturize the skin regularly. If anything, over time regular waxers will actually notice a slower and finer rate of hair growth. This is caused by weakening of the hair follicle which in turn breaks down the papilla and the hairs will be lessened. Less hair equals less ingrowns! All in all, the results you will feel and see from waxing speaks for itself. If you haven’t tried waxing before its time to open those eyes and see the long lasting results you are missing out on! Just as the saying goes ‘practice makes perfect!’ after the first few times you will be a complete pro and your razor can happily settle into retired life.